Lock Scott Cummings says Glasgow Warriors have been instructed to play free-flowing attacking rugby by new head coach, Dave Rennie. In his five years at Scotstoun, Rennie's predecessor Gregor Townsend instilled a similar high-tempo style. And Cummings says Rennie will look to continue that focus this season. "We're given a free license to play heads-up, expansive rugby and we've definitely got the players to deliver it," Cummings said. "Sometimes we're maybe doing a bit more contract drills, he's really focusing on our speed of play. A lot of it is still the same; he just knows what he wants." The incoming Rennie won two Super Rugby titles with the Chiefs in his native New Zealand, with his team's attacking verve highly compatible to Glasgow's long-standing desire to play with pace and panache. Cummings cantered in from almost 50 metres to score one of six Warriors tries in their pre-season thrashing of Dragons on Friday. 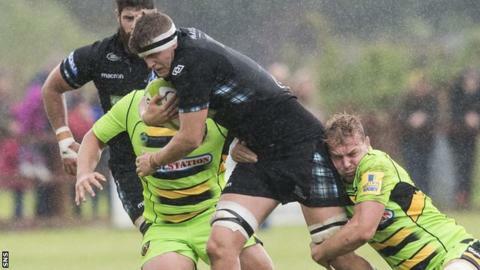 The former Scotland Under-20 captain is still developing physically, and ahead of Saturday's Pro14 opener away to Connacht, says he hopes to put his mobility to good use. "I'm not physically the biggest lock, I'm not massive, so I do like to play an expansive game and run hard lines," Cummings, 20, said. "Moving the ball just means when we come up against teams with a lot of size, we can move them off the ball and try and tire them out that way." The second row was handed his Warriors debut by Townsend at the tender age of 18, and with his former club mentor now leading the national team, Cummings was included in a three-day Scotland camp during August. "It was huge and something I've been aspiring to for years," Cummings said of his call-up. "It's always been a dream of mine; to get that taste of it was amazing. "You can see the step up in play, how fast it is, every little detail everyone focuses on. It's sort of shown me where I need to be at if I want to be at that level, and there are areas I can improve on, analysis and stuff like that. It's given me a level to aspire to. "Gregor's all about playing quick, high-tempo rugby like Glasgow played last year. At Scotland it's another step up - you need to know your roles exactly so you can play at that speed. If you don't know your roles, stuff starts to go wrong. "Everything's done at 100 miles-an-hour and you're expected to perform well. There are a lot of guys all competing for the same positions."